Oscar-winning actress Halle Berry has confirmed that she will once again control the weather in Bryan Singer's upcoming X-Men: Days of Future Past film adaptation. When you recall 20th Century Fox's X-Men trilogy from the early past of this century, what key aspects pop up as your fondest memories? No doubt, Patrick Stewart's turn as Professor Charles Xavier is on the list. Likewise, Ian McKellen portrayed an excellent Magneto. Even the then-unproven Hugh Jackman turned in a great performance as Wolverine (before the series completely fell apart in 2006's X-Men: The Last Stand). Beyond those three though, what springs to mind? Assuming you're cool -- and we are assuming that anyone reading this text must be cool -- your immediate answer was Halle Berry's turn as Ororo Monroe, the mutant more commonly known as "Storm." Did Berry trump the three acting heavyweights mentioned above? No, but as far as cinematic superheroines go, she's one of the best almost by default. Hopefully you feel the same way, as Berry just confirmed that she's returning for the upcoming X-Men: Days of Future Past (the sequel to 2011's X-Men: First Class), and in keeping with continuity will be once again be portraying Marvel Comics' favorite weather witch. In an interview with Black Film to promote her role in the upcoming, inexplicably WWE-produced The Call, Berry was asked straight up whether or not she will ever reprise her role as Storm. With surprising candor, Berry responds in the affirmative. "Yeah. The fans really love Storm," Berry says with a smile. "I'm really happy that it's worked out that way. No matter what my part will be or won't be, being part of it is always a good thing. I love it." The second to last sentence of Berry's statement seems to indicate that she's unclear on what exactly Storm's role might be in Days of Future Past. That makes a certain amount of sense given that the movie is still more than a year away from its theatrical debut. However, it makes us curious at the scope of Berry's appearance. If she has signed a contract to appear as Storm, she should at least have some idea of how much work she's going to have to put into the role and how often she'll be needed on set. If she only needs appear for a few days her role might be a small cameo similar to Hugh Jackman's appearance in X-Men: First Class, but if its more than that perhaps Storm will be a large presence in the film. We're hoping for the latter, as Storm played a crucial role in the original comic book storyline on which the Days of Future Past film is based, but given Hollywood's tendency to monkey with source material we wouldn't be surprised to see a film that barely resembles the tale we've come to love since its publication over three decades ago. 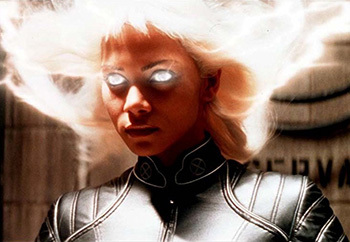 Until Berry or one of the film's crew members offers more information, we're going to have to continue wondering, but at least for now you Storm fans (or those who wore through their DVDs of Swordfish by pausing a certain scene over and over and over again) can cling to the news that she will be featured in X-Men: Days of Future Past.